Mike M. vigorously scrawls down answering machine messages onto a tiny paper form. He is in the midst a 20-message sprint. Hunched over a landline phone, he punches through the voicemail menu to retrieve the backlogged messages. He listens for key pieces of information: permit number, address, contact, date, time. He emerges from the sprint. It has taken twenty minutes. It’ll take five to ten more to look up the addresses on Google maps to assign the requests to the correct Inspector. Mike does this several times a day. There are approximately 87,000 inspections request every year in Long Beach. A small restaurant could go through nearly 40 inspections to bring them up to code. 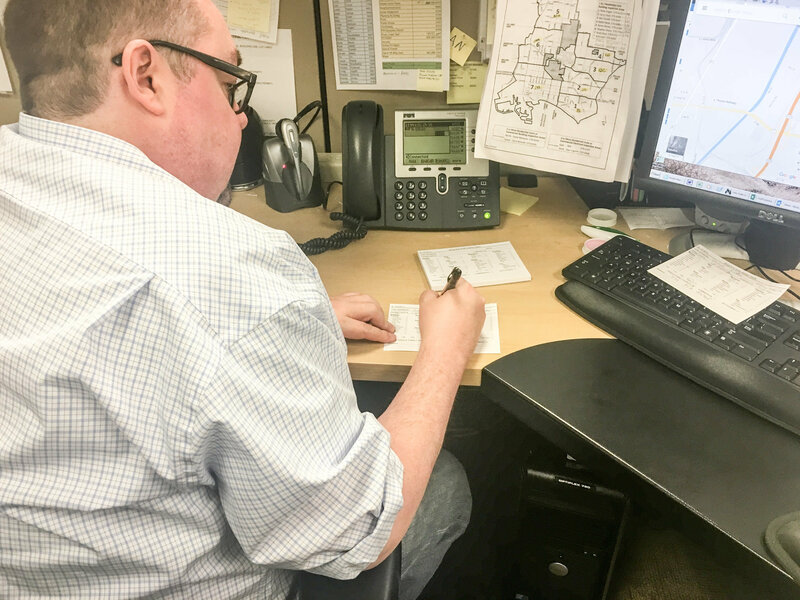 The current way residents submit their inspection requests is by leaving a voicemail -- the same voicemails that Mike checks multiple times a day. Three Permit Technicians like Mike will spend up to six hours a day transcribing messages. The city estimates that this can take 1,530 hours a year and can cost $52,000. Additionally, they estimate tracking and reporting of inspections can cost $49,300, totaling $101,300. 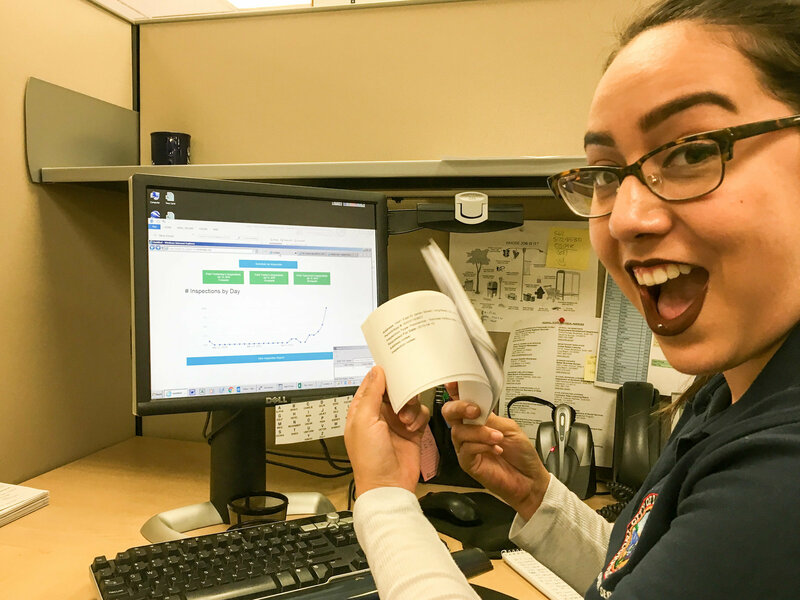 The Long Beach fellowship team created an online inspections scheduling form - Inspector Gadget - to simplify the process and save the city time and resources. Now, instead of spending 3 minutes leaving a voicemail, you can submit a request in 30 seconds online. And now people like Mike spend 20 seconds hitting the print button instead of spending hours of his day with his notepad. So, how did we get here? The magic of an MVP – minimum viable product. Permit Technician Mike M. transcribing inspection requests from voicemail. Product development is the process for building an application. It usually happens in multiple phases from simple concept to fully functioning program that gets used by the public. The first phase is called prototyping. It’s where you create a Minimum Viable Product (MVP) that shows proof of concept that someone can react to. One of our main advocates has been Dale Wiersma, Principal Building Inspector and Building Development Services supervisor. He saw the value in what replacing paper forms with a simple digital solution could bring to his team: hours saved, resourced conserved, data collected, and the like. At the beginning of March, we built a quick prototype, a standard web-form where people could enter their information and submit their request. We showed it to Dale and Inspection Services Manager, Evan Zeisel to get their initial impressions. The return was immediate, they started helping us to shape the application right there in the meeting. The MVP gave us the go ahead, but we needed to get it in front of real users. We moved to the second phase of product development or ‘alpha launch’ testing of Inspector Gadget with city staff. Testing is a big part of this phase, it helps work out the bugs and see how people are actually using your product. Launching quickly and often is important to keeping the momentum going and making sure that our city partners were still interested. We knew we wanted to move rapidly, and get as much feedback as early as possible. Two weeks prior to launch, we shared the launch plan Google doc with our city partners. We refined the plan through team and one-on-one calls. Dale, Principal Building Inspector, helped shape the schedule with the Permit Tech and avenues for reporting daily progress. Our city partners also helped schedule Inspector Gadget demos with government officials to make sure everyone was in the loop. Throughout the course of testing, the fellowship team shared real-time updates that included notes, images, and videos of the Permit Techs testing Inspector Gadget. We also used Slack to help with quick fixes and held calls at the end of the day to talk through progress. In less than a week, the City’s four Permit Techs were comfortable using the Inspector Gadget online form in lieu of paper slip forms. They were able to enter information from voicemail directly into the form and print out the inspections for the day on slips of paper that when cut fit into the inspector's boxes. With Inspector Gadget, the City is able to track statistics of how many inspections are scheduled daily, weekly, monthly, what kinds of inspections are the most common for residential or commercial use, and the frequency of inspections for each inspector. Long Beach and the Permit Techs can now see where time is being spent and are gaining an understanding of where the workload for inspections lie. Creating an MVP and moving to alpha demonstrated that we could launch a product and how having a good plan helped us through the process. The hardest part about launching a product is building the simplest idea. Once you’ve identified a problem, find the people it affects, and create a quick fix. Then put it front of people, create a process and timeline for testing, document the bugs, and make quick fixes in real time. The great thing about this kind of process is that works on multiple levels not just with technology. Inspector Gadget is currently in Beta, or a phase of public testing. It has been launched on the city's website, and is one of seven online inspection scheduling tools out of 88 cities in Los Angeles County.